Before we talk about anything else, I think it’s important to note that I actually waited to share these little guys until AFTER Thanksgiving. I think that deserves: ????? well, a celebration. This was especially a feat to wait and share these because I’ve had the idea to do these little reindeer since Halloween time. 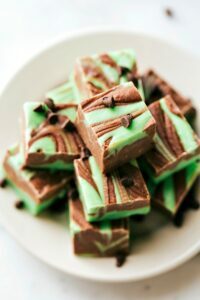 After making those 4-ingredient bat bites that were such a huge hit with you all, I wanted to do a Christmas version. 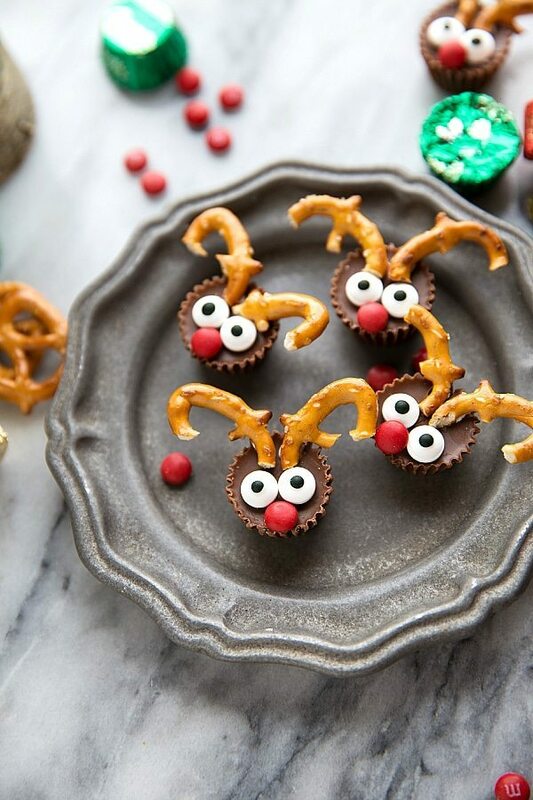 Cue: mini reindeer treats! And special thanks to everyone that made those bat bites and sent me pictures or tagged me on instagram. It was so fun to see those little bats re-created so much in the month of October! 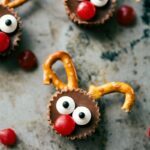 So now we’ve got some reindeer and while there is one more ingredient in these treats than there were in the bats, they are still so quick to make! This time, instead of breaking up oreos to create wings, you’ll break up pretzel twists to create antlers. Warning: there will be pretzel casualties! It’s not quite as easy to break the pretzels perfectly as it was oreos, but they aren’t too bad. After you break a few, it gets easier and quicker! The little “Ruldoph nose” is a miniature red M&M. I think it’s what tastes best when combined with the Reese’s. And then the edible eyes — you can find those either online or in stores. They can be found in craft stores in the baking aisle (I’ve gotten them at Hobby Lobby and JoAnn’s) or in some grocery stores. I’ve found them in grocery stores near the sprinkles and cake decorating things. Fit a frosting bag with a #2 or #3 tip and fill with frosting. Alternatively fill up a plastic bag with frosting and cut of the very tip of the corner of the bag with scissors. This will work as a frosting bag. Frost the back of the pretzel "antlers" and gently press into the top of the Reese's cup. 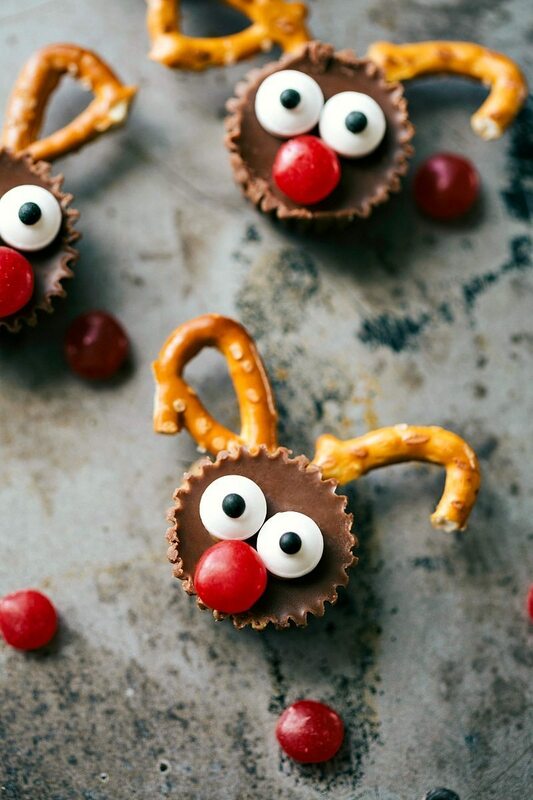 Using the frosting, attach the edible eyes using frosting below the pretzel antlers. Using the frosting, attach the mini red M&M below the edible eyes. Continue to press and secure any of the pieces that aren't sticking until firm. How cute are these!?!?!? Love them!!! So cute and easy to make! Pinning! I’m hoping to get my 3 yr old to enjoy making these for the family. Thanks for the idea, so adorable! as always…these are the cutest!